Proponents walk the new Phoenix Fitness Trail. 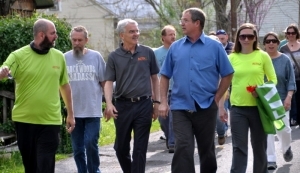 Officials say a fitness trail unveiled today in Mount Hope is only the first phase of an initiative that could help attract investment to the community and function as a blueprint for fitness development in small towns elsewhere in West Virginia. 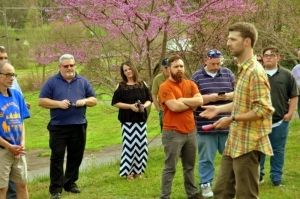 The one-mile Phoenix Fitness Trail will tie into a rail-trail being developed in association with the adjacent Bechtel Scout Reserve and will eventually become part of a regional trail system, according to Andy Davis, a resource coordinator for Active Southern West Virginia. Davis welcomed dozens of local dignitaries and spectators to the ribbon-cutting for the trail, which wanders the margins of a stream that frequently flooded homes that have since been removed. The new trail provides residents several benefits, Davis said, including the opportunity for a more active lifestyle and the promise of living in a community that’s more attractive to business investment. “Businesses are more likely to invest in communities in which residents are more active, and workforce development is at the root of what Active Southern West Virginia is about,” Davis explained. “Businesses are now able to lower insurance costs if they can document the fitness of their employees,” he said, verifying the real-world economics of healthy living. The trail is also part of a system of walkable and bikable trails that follows established routes through the historic community of just-more-than-1,000 residents and which has also been developed by Davis and Active Southern West Virginia over the past two years. The development program will soon move on to improve similar communities in south-central West Virginia where the fitness organization was established three years ago. Davis said documentation of the Mount Hope project will be used to assist in similar development projects in the region and elsewhere. Grant funds study of eight-county trail system in so. W.Va.